My grandmother, Elizabeth Easton Findlay, was born in 1893 in Cumbernauld County, Dunbartonshire, Scotland among [at least, perhaps] eight children. At some point in her early 20s, she emigrated from Scotland to Halifax, Canada. 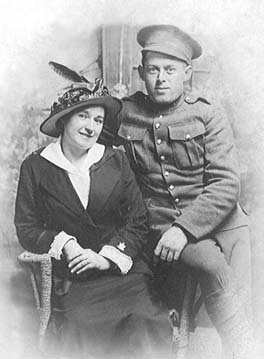 It was in Canada she met and married my grandfather, Lester Henry Capels, who would later abandon her and their seven children in Syracuse, New York. What of the family she left behind in Scotland? Cautions There is great risk in reading too much into isolated pieces of information. Imagine trying to figure out what an elephant looks like with only a toe, an ear, or just the snout as clues. The further we go back in to time, limited available records--if we're lucky to find any at all--provide only a momentary glimpse into a situation, and often subject to the interpretation or limitations of the person recording it. Contributions Any information, corrections, clippings, suggestions, and/or photos offered that will help weave the fabric and reveal the texture of our family's history will be greatly appreciated. All photos or other original documents will be handled with great care, copied, and promptly returned to their owner, unless instructed otherwise. While I am eager for ANY information, including stories and oral histories, that will help tell our story, I also want to be respectful of people's privacy and to use discretion in matters that may be sensitive. This document is only as complete and accurate as the information available up to this moment. No doubt it will continue to evolve over time, as it should. I hope you enjoy the Findlay story. Tracing Your Scottish Ancestry, an excellent collection of Web resources and other information about searching your Scottish roots. ScotlandsPeople, official government source for Scottish genealogy. Cyndi's List, comprehensive index of UK-Scottish genealogy resources. Dunbartonshire County, Scotland, a ScotlandGenWeb project. Scottish Genealogy Society, a ScotlandGenWeb project. Canadian Genealogy Corner, a collection of resources for the various provinces of Canada. Ancestry.com (an affiliate of MyFamily.com), connects Internet users to hundreds of millions of fully searchable individual records, about half of which is free and other half available by subscription. Cyndi's List.com, a categorized and crossreferenced index, or "card catalog" to the immense library of genealogical resources on the Internet. Lineages.com, a major genealogy reference library and resource center built and maintained by professional genealogists to serve the needs of beginning researchers and experienced family historians. RootsWeb.com (also an affiliate of MyFamily.com), is the oldest and largest FREE genealogy Web site, containing numerous interactive guides and research tools, including the WorldConnect project.